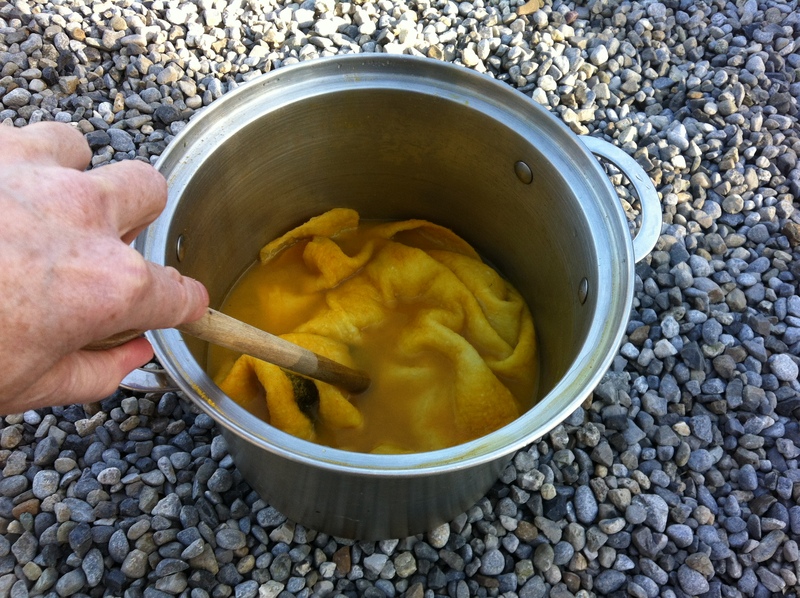 Dyeing felt with turmeric, a Clasheen style diy project! Amongst everything else I got up to yesterday I had the strongest urge to felt one of Chrissie’s new designs from our upcoming book and then decided to dye it using turmeric from my larder! At the time I should have been preparing 35 starter felting kits (yes, my 26 students multiplied magically) for our first CRAFTed session but I justified the felting by telling myself I could edit the relevant section of the book better if I actually had made the piece myself!!! For this piece I worked with a combination of white ponge silk and white needle punched felt from my stash and used a few torn strips of black silk chiffon for embellishment. Before I started the dyeing process I quickly checked a couple of good blog posts that I pinned recently to my ‘textile techniques to remember’ board, the posts I pinned were from red2white, Art Threads and PAGES FROM MY moleskine. 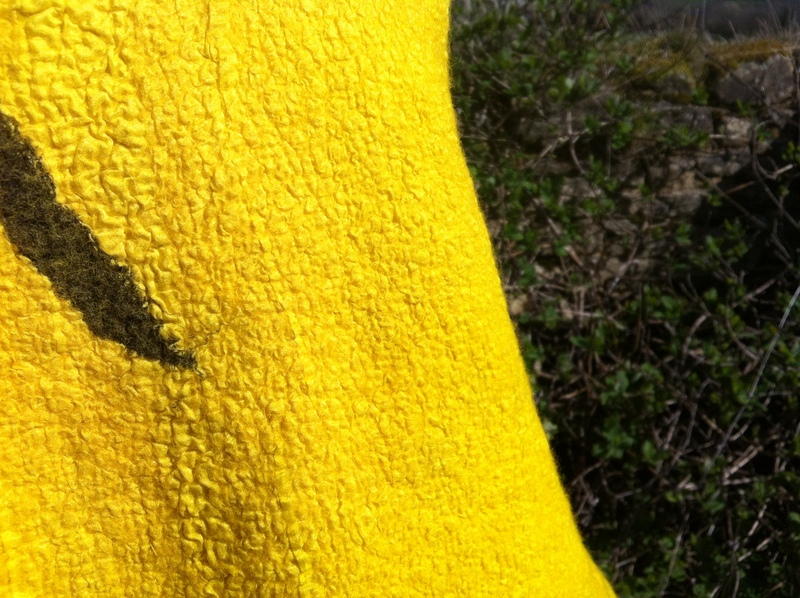 I’m not going to spoil Chrissie’s surprise by revealing the garment design but here are the steps that I used to achieve a gorgeous warm yellow colour! NB, I just dyed my nuno felt when it had finished felting but prior to drying but if you wanted to dye an already dry piece you would need to make sure it was totally wet through first. Now for my step by step process…. Mix approx 30g turmeric into a couple litres of hot water and stir, I use turmeric in Indian dishes so had it in my larder already! I love the final bright yellow colour! This entry was posted in Book with Chrissie, Dying, Felt, nuno felt and tagged dyeing, dyeing felt with turmeric, Felt, nuno felt, turmeric by Nicola. Bookmark the permalink. How will you keep the colour from fading? I tried turmeric once with wool and after a couple of hours in the sunlight it faded to an unattractive pale ochre. That is truly a gorgeous colour! What is a fugitive dye? The color came out just beautifully. Turmeric is supposed to be an Alzheimer’s preventative, so I’d better consume some before putting it all in the dye pot!